Many would exclaim “You have the best job in the world!” when they find out I eat for a living. But behind the endless tastings are countless wasted calories spent on bad grub. Thankfully, Jam At SIRI HOUSE did not once make me regret the added pounds. 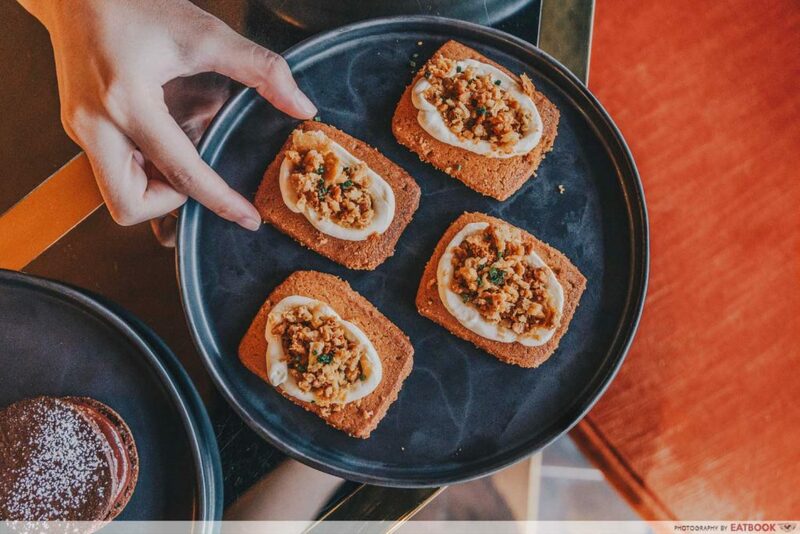 Opened by Thai real estate developer, Sansiri, this new restaurant at Dempsey impressed me with an interesting menu featuring favourite local flavours. 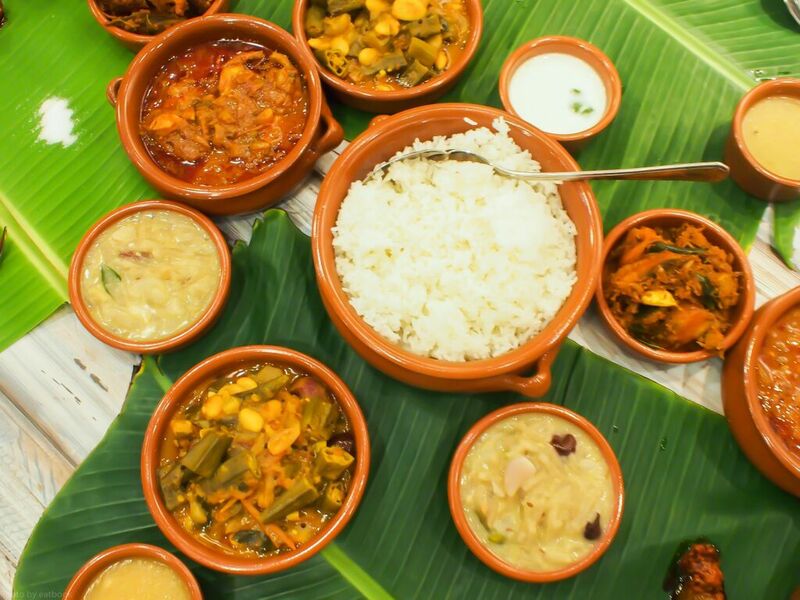 Stepping into the restaurant with no prior knowledge of what they served, I was surprised to find more comforting dishes and wacky play on flavours than fine dining food. Then, I realised why; helming the kitchen were culinary mavericks, Ming Tan and Jeremy Cheok. 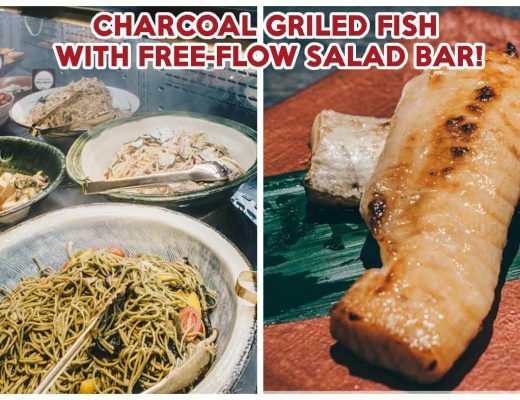 The former co-owns famed sandwich cafe Park Bench Deli, while the latter was previously from New Ubin Seafood. Excited to see what the duo had in-store, I decided to order their Chicken in a Biscuit ($12++), which was inspired by the popular children’s snack and Chef Ming’s guilty pleasure. 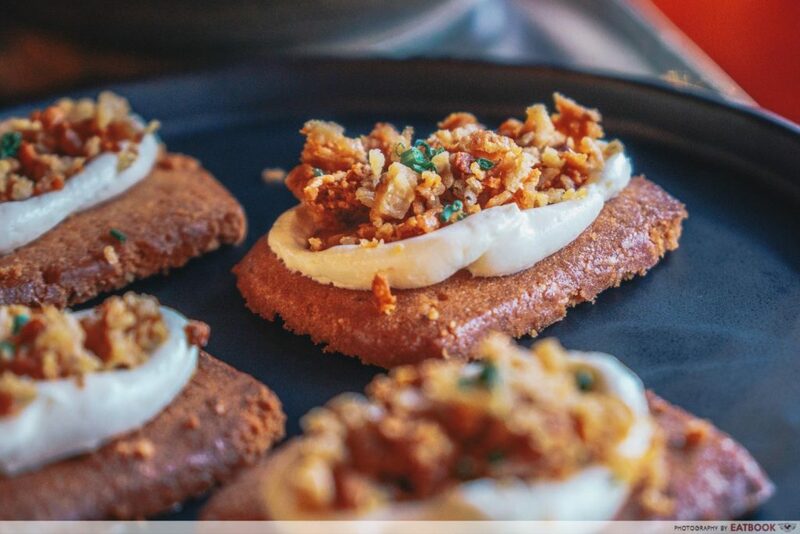 Made predominantly from chicken fat drippings, the savoury cookie base crumbles and dissolves in your mouth with a buttery richness. Due to its fragility, the best way to savour this is with your hands – and a plate held under your chin. It comes paired with a generous swirl of ginger and garlic cream cheese, which gave a sharp cut of spice amidst the rich chicken flavours. There’s also chopped chicken skin for texture. 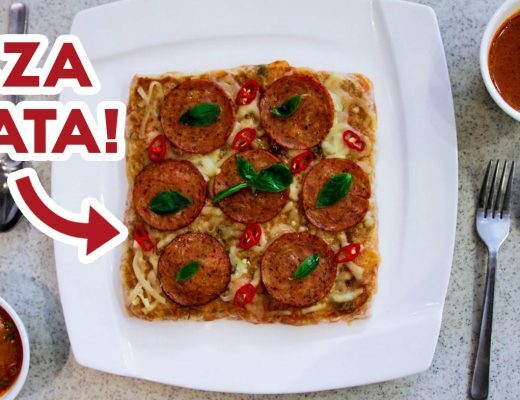 Despite having only three ingredients, this bite-size snack delivered a bounty of scrumptious flavour. 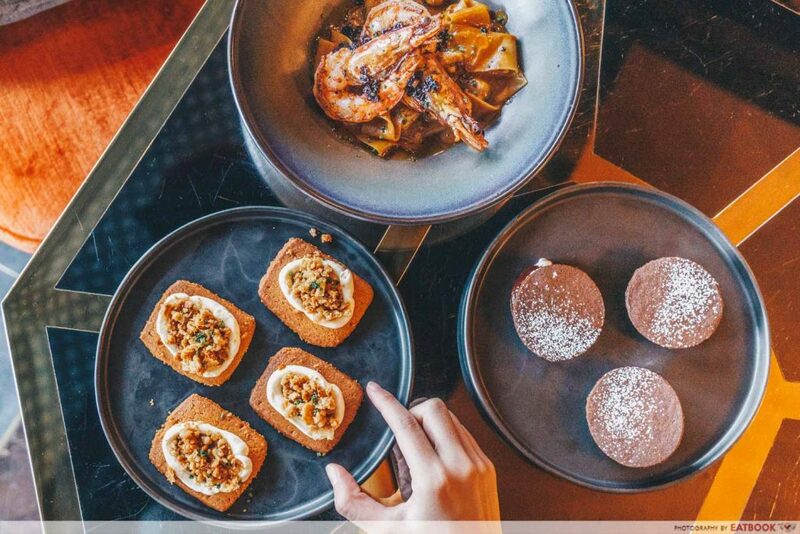 The dish comes with four biscuits, and their richness means sharing is recommended, but the glutton in me wishes I could have an entire box to binge on at home. 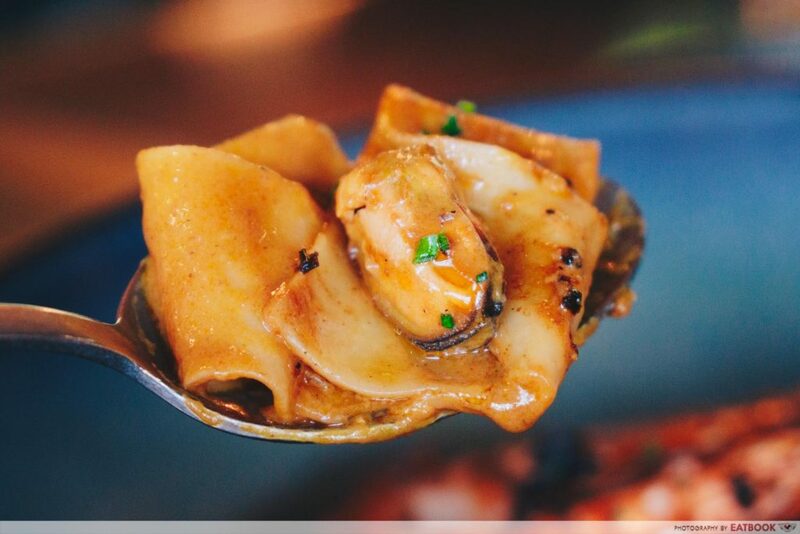 If you’ve ever wondered what umami tastes like, order the Pappardelle ($33++). 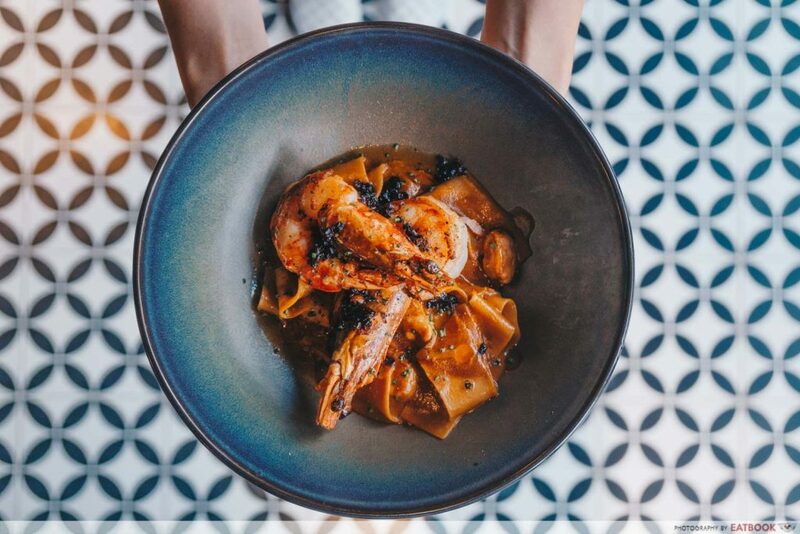 Fresh handmade pasta and two massive pan-roasted prawns and baby mussels are tossed in a tantalising bisque-like sauce. 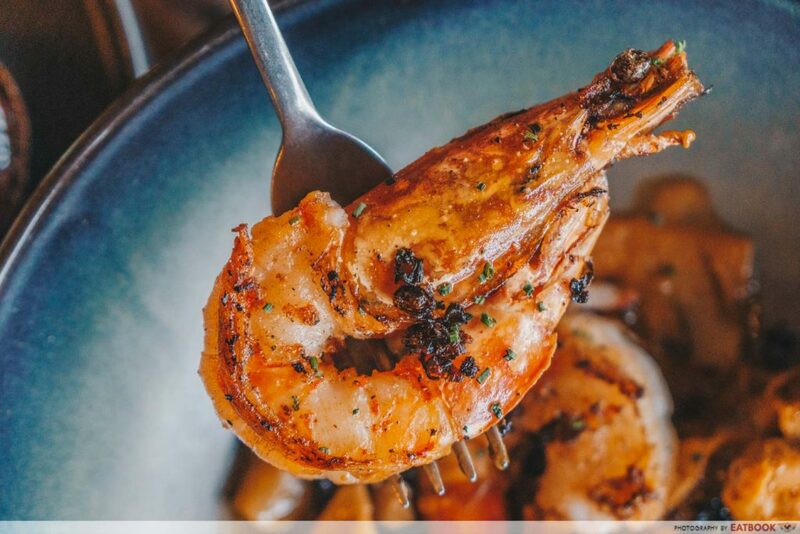 The concentrated sauce is the painstaking result of roasting prawn and lobster heads in butter, before slowly cooking it in cream and mirepoix for a minimum of eight hours. Boating a brownish hue, the sauce is heavy on crustacean flavour, with a deep sweetness greeting your palate first, before finishing with an intense brininess. It’s unlike any pasta sauce I’ve ever tasted — and I worked in a legit Italian restaurant for a year. The broad sheets of pasta ensure none of that umami goodness goes to waste, as it does a good job in holding onto the sauce. While they were cooked well, the charcoal-oven baby mussels and pan-roasted prawns stood rather lacklustre against the full-flavoured sauce. They would have fared better by having a stronger smoky aroma, to give this dish a wider spectrum of flavours. 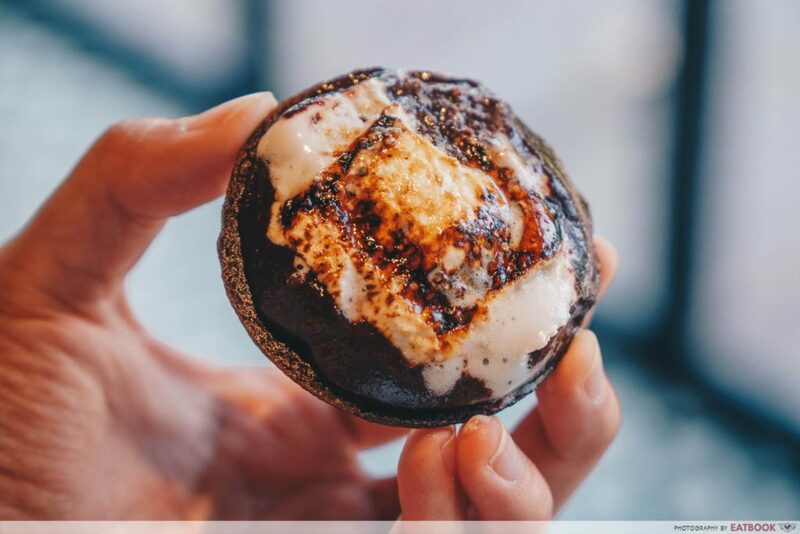 For dessert, we opted for the S’mores ($18++). 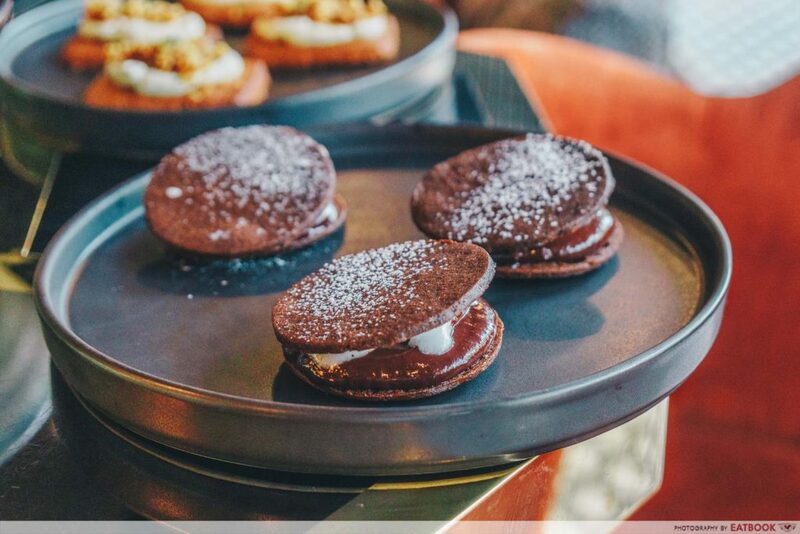 Good to share among three diners, the dessert features a house-made graham cinnamon biscuit sandwiching a thick, smooth layer of raspberry ganache and vanilla and honey marshmallow. The latter is blow-torched to a sticky consistency, and holds the dessert together. Although this sweet treat provided a decadent end to our meal, we appreciated how it wasn’t overly sweet or complex. Using only 65% Valrhona Manjari dark chocolate and unadulterated raspberry puree, the ganache was impressive, with a rounded sweetness that’s balanced off by a nice tart bite. The cinnamon spice also gave a woody aroma, which helped uplift the dessert’s flavour profile as a whole. 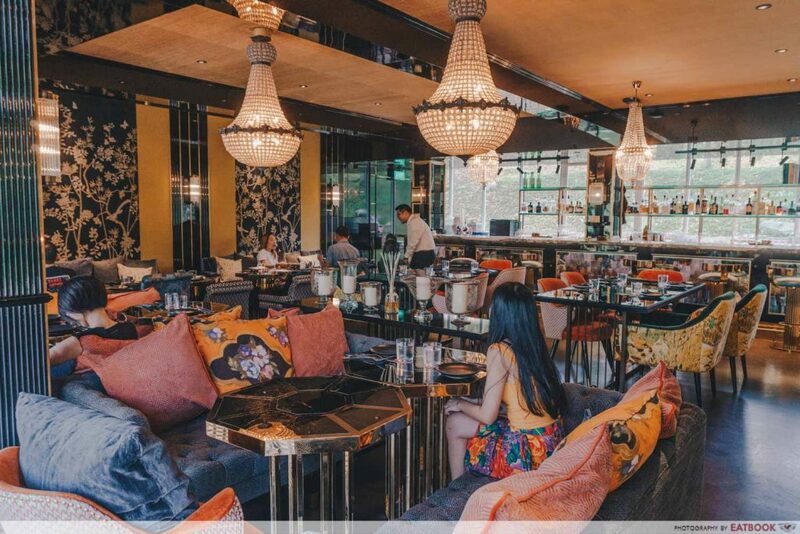 Set to resemble their service apartments in Bangkok, the 42-seater restaurant features floral-print designer sofa and Edison crystal chandeliers. There are also splashes of bright colours borrowed from the throw pillows, which add vibrancy to the space. All this is juxtaposed against a hand-painted chinoiserie wallpaper. It’s very ostentatious, but I’m all for the Crazy Rich Asian lifestyle, so I absolutely adore the ambience. My colleague, however, says it’s too gaudy for her. You be the judge. 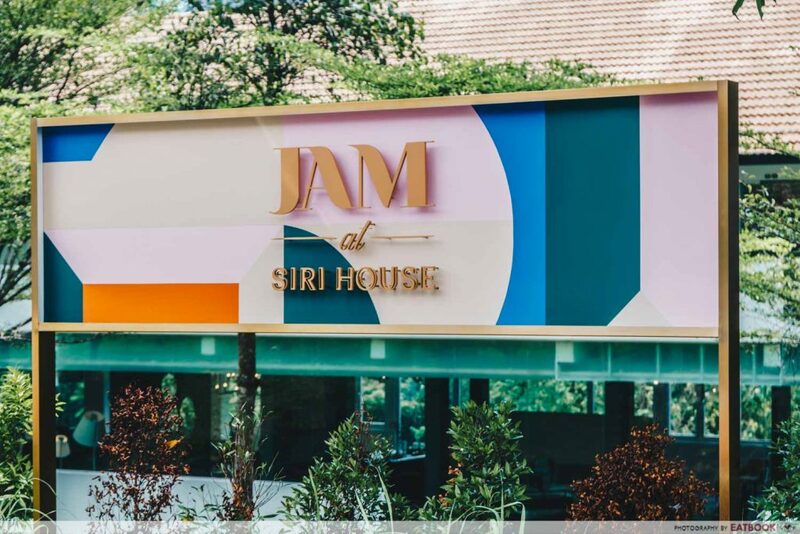 Jam At SIRI HOUSE aims to bring the experience of home-dining with your friends to their swanky restaurant. And I gotta say, while I doubt I will ever serve such labour-intensive food at any house party I’m hosting, the food here does bring comfort to your belly, and is more homey than pretentious. Photos taken by Kit Shan.